The Hollywood Hills are the eastern end of the Santa Monica Mountains, and while the majority of the area is privately owned, home to hundreds of the largest and priciest mansions in Los Angeles, the easternmost few miles are part of Griffith Park - a sizeable (6.5 square mile) city park containing several famous buildings around the perimeter, linked by a network of trails across the manzanita and oak-covered hills and canyons of the relatively undeveloped interior. The highlight for many people is Griffith Observatory, an iconic white stone building on the south edge of the hills that provides some of the best elevated views of downtown Los Angeles, 5.5 miles further south. 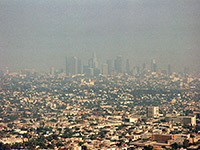 The regular urban street grid extending towards the skyscrapers on the horizon is one of the most photographed scenes in the city; the complete opposite of a natural landscape, but an impressive sight nonetheless, even though the vista is often obscured by thick smog. Entry to Griffith Park is free, as is parking, and at least one full day could be spent visiting the attractions and hiking a selection of the trails, which offer alternative views of the city and the northern suburbs. Beside the Observatory, other sites within the park include Los Angeles Zoo, the Greek Theater, the Gene Autry Museum and the Hollywood Sign. Griffith Park is enclosed on most sides by freeways and on the south by Los Feliz Boulevard, and may be approached from several directions - see map below. 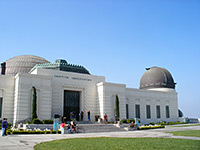 Griffith Observatory is reached by Vermont Avenue, which runs northwards from Los Feliz Blvd, initially through half a mile of well presented suburbia of large trees and even larger houses, then crosses into the park and first passes the extensive parking area beside the Greek Theater. This is the main outdoor entertainment venue for Los Angeles, used for rock/pop concerts and stage shows, and is capable of seating nearly 6,000 people. The road continues up Vermont Canyon to the rather smaller parking lot for observatory, though as much of the roadsides can also be used for parking there are usually plenty of spaces even on busy days. A fee is required to enter the building and inspect the planetarium, telescopes, museum and other attractions contained within, but there is no charge to walk around the outside. Views on a clear day are of east Hollywood, west Glendale and across to central Los Angeles, and include the famous Hollywood Sign located 1.6 miles northeast near the top of Mount Lee - also within the park. The Vermont Canyon Road links with several other roads, both dirt and paved, though all are open to foot and bicycle traffic only. The most popular hike in this area is to the summit of Mount Hollywood, a 3 mile round trip involving 650 feet of elevation gain. Griffith Observatory, and the park in general, have been featured in many films, most famously James Dean's Rebel Without a Cause. 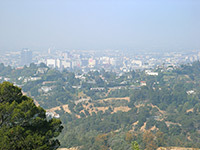 Hotels near Griffith Park can be found in the neighboring cities of Burbank, Glendale and Hollywood. The northeast corner of Griffith Park is occupied by Los Angeles Zoo, close to the I-5/Hwy 134 intersection. The northern park entrance is 1.5 miles west along 134, from where Griffith Park Drive links with the southeast entrance, near the I-5/Los Feliz Blvd junction. Along the way are a variety of places including picnic areas, trailheads, gardens, sports facilities, the Harding and Wilson golf courses, the Gene Autry Museum (showcasing western history and heritage) and Travel Town (another museum, featuring a collection of historic trains and cars). There are a few more access points in the southwest - one at Fern Dell a little further along Los Feliz Blvd, and two via Beechwood Drive and Canyon Drive which lead to a less-visited section of the park, popular for hiking; this is also the best place for close-up views of the Hollywood Sign, via Mount Lee Drive. 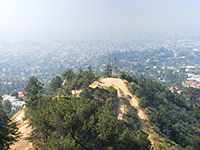 The west edge of Griffith Park is generally inaccessible, shielded from any roads by the steep slopes of the highest part of the mountains, 1,820 foot Cahuenga Peak.